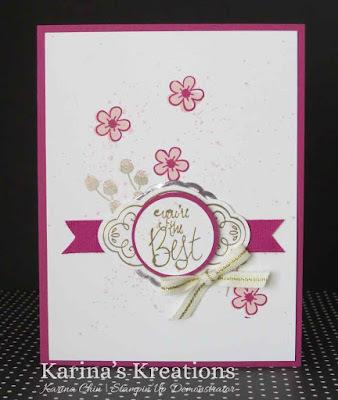 Karina's Kreations: Stampin'Up Label Me Pretty! I was making a bunch of swap cards with the Happy Birthday Gorgeous stamp set and added a few images to a piece of 4" x 5-1/4" Whisper White card stock. I added some Berry Burst Ribbon and a left over stamped image from the label Me Pretty stamp set and Pretty Label Punch and made this card. -145305 Label Me Pretty Bundle which includes the stamp set and punch.